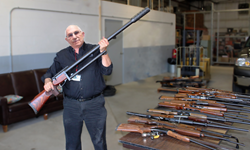 e-End President, Steve Chafitz, holds confiscated 50 caliber sniper rifle while standing next to other confiscated weapons to be destroyed. Hundreds of deadly assault weapons amassed by Washington area law enforcement agencies have been safely destroyed by a woman-owned company. Advanced tactical firearms of every size and caliber are confiscated by local police and federal agents during drug busts, traffic stops and search and seizures. Many of these are military grade firearms capable of penetrating bullet-proof vests, body armor and police cars. These weapons include: Fully automatic AR-15s, Kalashnikovs, 50 caliber sniper rifles, shotguns semi-automatic and fully automatic handguns; 50 caliber pistols, and some of the most advanced tactical rifles representing every size and caliber. These are the weapons of choice for organized crime syndicates, drug cartels, terrorists, and others seeking to inflict mass casualties. 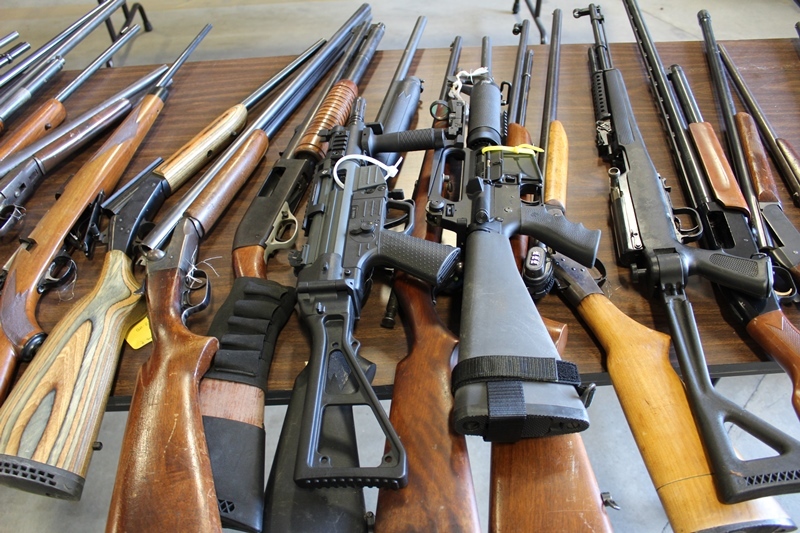 Many of these are the same assault weapons banned in Maryland’s Firearm Safety Act of 2013. Notably, The U.S. Supreme Court has just refused to hear arguments asking for the potential repeal of this act. “If these weapons were ever to fall into the wrong hands, lives would be at risk; especially those of our police force,” warns Arleen Chafitz, CEO of e-End, the woman owned company selected to destroy these weapons. “Many of these confiscated weapons are powerful enough to pierce the door of a police car, fatally wounding the officers inside and exiting the car with enough force to fatally injure anyone on the other side. Some people wonder why police departments request armored vehicles, well, a firefight against criminals with these high-powered weapons could lead to massive law enforcement fatalities. That’s why they need armor to protect them. Getting these guns off the streets and destroying them properly is one step in helping to keep our police force a bit safer,” claims Chafitz. Destroying deadly weapons in a safe and secure manner can prove to be a challenge. Many police departments accumulate massive arsenals of confiscated firearms needing to be rendered completely harmless. These caches of weapons are often removed from their secure sites and brought to less secured facilities for destruction. Transporting several hundred deadly rifles, shotguns and pistols to a destruction facility can be both a risky and expensive mission. e-End found the solution by eliminating the need for the weapons to leave the secure facilities. Instead of bringing the weapons to e-End, e-End brings their specialized destruction equipment to the weapons. “Our process saves time, money and is a lot safer than taking these weapons out of their secure storage. Now, we only need two on-site observers versus an entire SWAT team. With our mobile unit, we can destroy several hundred rifles, pistols, magazines and contraband in a couple of hours,” adds Steve. As illegal firearms become more powerful and relatively easier to obtain, the need to destroy them becomes even more crucial. Each illegal weapon that disappears from the streets is one less potential danger to the community and law enforcement. “e-End works closely with many state and federal agencies,” explains Arleen. Due to security concerns, she would not comment on which specific agencies they assist. About e-End:e-End operates a secure facility in Frederick, MD and specializes in destroying a wide variety of classified data, and various controlled devices. This includes destruction of data containing hard drives, destruction of ITAR controlled devices, IT equipment, and tactical military devices. They routinely destroy body armor that has reached the end of its certified period of use. For further information contact Steve Chafitz, steve(at)eendusa.com.